We conduct inquiries on our own initiative or on the basis of a complaint. We have extensive powers to access personal data, information and documents which are necessary for our inquiries and to access premises, in case an on-site investigation is needed. An inquiry can be of a general nature, such as our survey on compliance with data protection rules in the EU institutions, which we conduct every two years. We also conduct more targeted inquiries on specific subjects, for instance, video surveillance in the EU institutions. In general, our reports on general and targeted inquiries are public. 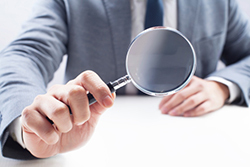 Some of our inquiries are conducted to investigate complaints or issues that have been brought to our attention. In order to respect the confidentiality of complaints, we do not make the findings of such inquiries public, for example, verifying if an institution correctly provided a complainant with access to her personal data by physically checking their files. General Report on "Measuring compliance with Regulation (EC) 45/2001 in EU institutions ("Survey 2013")"
General Report on "Survey on the function of Data Protection Coordinators at the European Commission"
General Report on "Measuring compliance with Regulation (EC) 45/2001 in EU institutions and bodies (“Survey 2011”)"
Letter concerning the proportionality of the information collected by the European Commission when awarding funding to projects carried out by national public bodies and/or private companies. Rapport général concernant l'"évaluation du respect du règlement (CE) n° 45/2001 au sein des institutions et organes de l'UE"
General report on "Measuring compliance with Regulation (EC) 45/2001 in EU institutions and bodies"
According to Article 41, paragraph 2 of Regulation (EC) 45/2001, the European Data Protection Supervisor is responsible for monitoring and ensuring the application of the Regulation. In March 2007, the EDPS launched a procedure known as "Spring 2007" as part of an effort to measure compliance with the Regulation in the various institutions and agencies and to take stock of the progress made so far.